I am deviating from my usual genre of writing because one of my readers commented recently on “The Character of Nature”, an article I wrote concerning the extremes of weather activity. That comment also suggested that I share more of my personal perspectives on grief as well as the weather. The weather, well, this is in the authority of God and I have not yet acquired nor developed the skills to assimilate the various instabilities in weather related disasters. I can only offer my condolences and support to the victims of these calamities, along with spiritual encouragement. As for as my thoughts on grief, well, there are literally hundreds of books and writings dealing with grief. I am not an authority on the subject and this does not in any way represent how one should or should not grieve. This is only my perspective on the subject. Just like everyone else, I have experienced loss. It is true that grief is unpredictable and inevitable, just like the weather, as the reader commented. However, I learned a long time ago that giving in to the very feelings of grief is understandable. It is an emotion, yet we cannot allow emotions to consistently dictate the way we live our lives. I believe we should live through the experience, not in the experience. There are lessons to be learned through these encounters. However, I believe at some point one must face reality. There is no time frame for overcoming grief. I cannot tell you how you should grieve over the nature of your loss. It is very personal. And personal stories of grief are just that, personal, to be shared only when you feel the time is right. My suggestion would be to encompass the love of God in dealing with grief. David wrote in Psalm 119:50, “My comfort in my suffering is this: Your promise preserves my life”. Thanks to Rainee C., for commenting and allowing me an opportunity to expound on this subject. It was indeed a mind opening topic. However, do not allow the seriousness of this article to keep you from having a wonderful day. Smile, be upbeat and check your humorous character. As I write this article, I do not make light of the circumstances of anguish and grieving. Certain parts of the country have received much more than their share of rain. I empathize in their despair for I too have experienced the misfortune and anxiety that comes with the disaster of flooding. My heart goes out to those who are suffering a loss, especially a loss of life. My prayers are with you. Do not lose hope. Lately, we have experienced drought conditions and extreme heat. Plant life is being raddled to their limits. Green shrubs are turning brown; their leaves curling under and giving up the ghost. The once vibrant green grass no longer rises above the plain. It too, is having a brownout. The peaches not ready for picking have all shriveled and shrunken. The pond is drying up. The heat is taking its toll. To keep all this watered is not only time consuming but it puts a strain on the pocketbook. Our water bill is approaching astronomical heights. The “Rancherwriterpoet” and the “Rancherette” have the utmost respect for nature; however, as humans, we do take the necessary precautions for keeping cool, that being under the influence of the air conditioner most of the day. Of course, the electric bill is in the stratosphere alongside the water bill. When we do venture outside, we do not tarry long. I’m pretty sure the neighbors would object were we to wear less clothing. 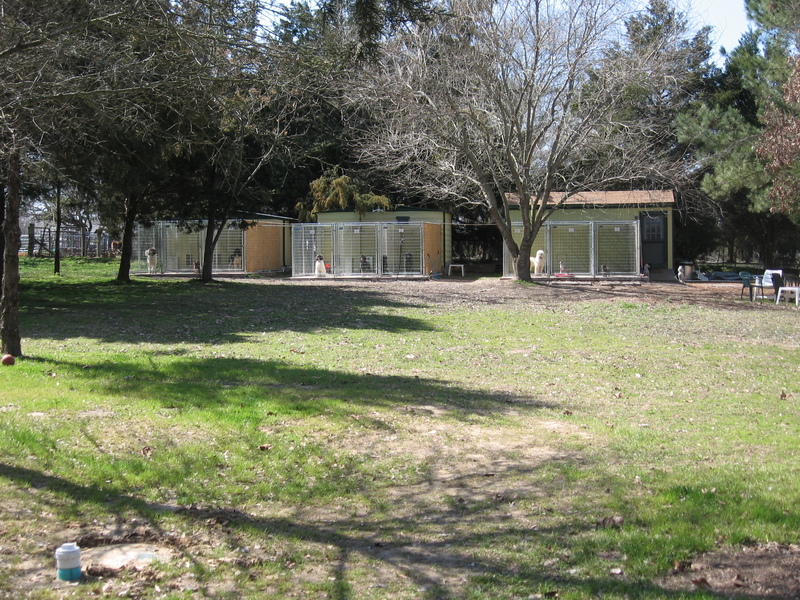 The kennel dogs do not really care for the misting system installed on their partially shaded pens. There is only a soft hot breeze blowing across their outdoor pens, but with the misting system, it does cool the concrete pads and the air. All the standard poodles have a summer cut yet some prefer staying inside their buildings and under the fans, as if they are fused to the floor (they do not like to get their feet wet). Others will lie comfortably just out of reach of the mist but close enough to feel the coolness as it comes across their body. Occasionally they stand up, shake off vigorously, turn round and round several times and lie back down. It’s what dogs do. When they lope out of their pens for their afternoon constitutional, they immediately tend to business and return to their pens. The afternoon sun is very warm and they prefer their shaded home sweet home. Conversely, the Silkie chickens do not seem to mind the heat as much as us humans or dogs. 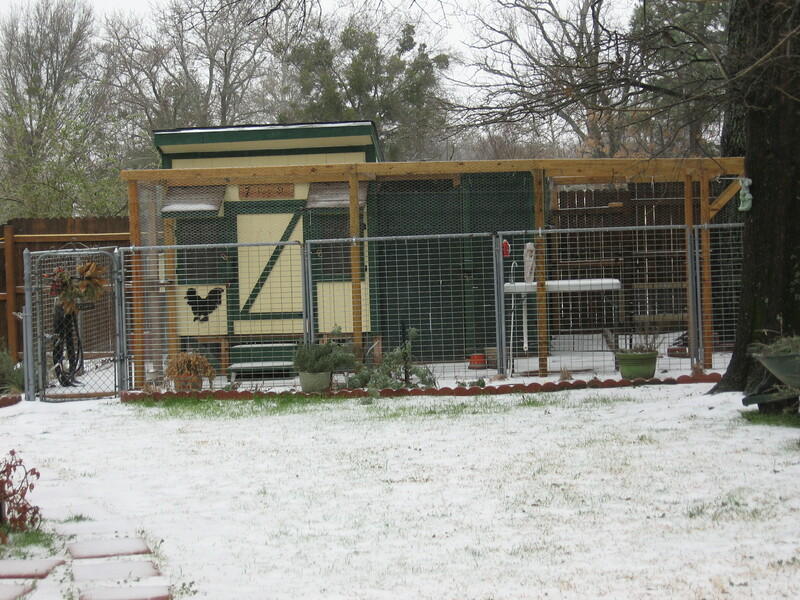 They are wont to hunt and scratch and peck and chest bump and do the chicken dance around their coop. They run in little circles chasing anything that moves. They are always snooping around for food no matter that they feeder is full. They engage in wide ranging conversations. Clucking and cackling, crowing and chirping, they express themselves quite effectively. Why, even the “Rancherette” understands chicken speak. This is how she knows to serve up frozen treats every afternoon; grapes, pineapple, and strawberries being among their favorites. They stand at the coop door and chatter vociferously, impatiently waiting for the “Rancherette” to calm their ruffled feathers. We obviously keep plenty of fresh water for them to drink. There are fans in their roosting coops for an air flow through their buildings. And did I mention the show birds domicile? These are the cream of the crop, uh, flock. They attend the chicken shows and bring home the bacon, uh, ribbons. They have they own individual pens, in an air conditioned building, never touching the ground or feeling the hot breeze outdoors. They have it made in the shade, so to speak. So, finally, the skies have opened up and delivered the much needed moisture. For three days, we have seen almost three inches of slowly absorbing rain, the kind necessary to break a drought. But, the kennel dogs do not like the rain any better than the misting system. The show birds do not even know it’s raining. It’s business as usual for them. The outdoor Silkie chickens do not care one way or another. All pens have some shade covering; but does not prevent the rain, so, instead of dust baths they now take mud baths. Good for the skin, I’m told, but their crested heads are having a bad hair day. In this case, they are wetter than an old mad hen. The good news? Plants and grass are smiling. The water meter is smiling. The electric meter is smiling and the air conditioner gets a break. I’m smiling. Nature is smiling. This winter of 2015/2016 has been one for the record books. I do not believe I have ever experienced the ups and downs, twists and turns and such variable temperatures as the season has brought us so far this year. I believe that you, the reader, no matter where you live, may have gone through much of the same. with a formidable mist in the air. Thunder will roar across the sky. will inconveniently cease to exist. marauding winds will subdue the calm. The rage in the air will angrily erupt. And the rains will stalk the stillness. That will put our minds at ease. the turbulence and the tension. knowing Who is in control. I cannot remember a winter like the one of 2015/2016. Warm and dry and wet and cold and windy. Fortunately, where I live, we have not yet seen any snow, however the season is still upon us and each new day brings us another repeat of the entire process. The cold has not been completely unbearable, the dry only lasted so long, and the wet filled the pond until the dry took over again. Yesterday, the temp was hovering around 40 degrees and the wind was blowing from the north about 20 miles an hour. I do not know the formula for determining the wind chill; I will guess it is cold! Today, the sun is shining, the temp is still around 40 this morning, however the wind is not blowing. It will make for a great day. But, that is how it is when you live in Texas and apparently other places as well. Mark Twain once said, “If you don’t like the weather in New England, just wait a few minutes.” People of numerous other states have obviously plagiarized that idiom. Thanks Mark Twain, for your input. I have traveled to various parts of the world, thanks, in part to the United States Navy. I have visited some of the most beautiful places on this earth through my tours with Uncle Sam and I loved every one of them. I have lived in other parts of this great United States. Everywhere I chose to live was a great place. Some had lofty mountains, some had great sandy beaches, and some had deep towering forests. I have lived in large cities and small rural communities, on major interstate highways, on dusty county roads and I loved them all. Each place I have ever visited or lived has its own peculiar idiosyncrasies. Some are quirky, others sophisticated, many quaint or contemporary, and complicated or simple, maybe elegant or primitive. The one thing they all have in common is the weather. Some days hot, some cold, some windy, some calm, some wet, some dry. Sounds a bit like Texas. A place I dearly love. My condolences to those of you who must live elsewhere. So, it has been a few days since my last post. Been busy around this “ranch”. Had new pens to build for the “rancherette’s chickens and what with the weather being nice, I just could not bear to sit myself down inside. I decided to close in the carport where I keep my mowers. Much of my lawn equipment is currently stored in the garage and we house our brooder pens there as well. Forget about parking a car inside, that will never happen. 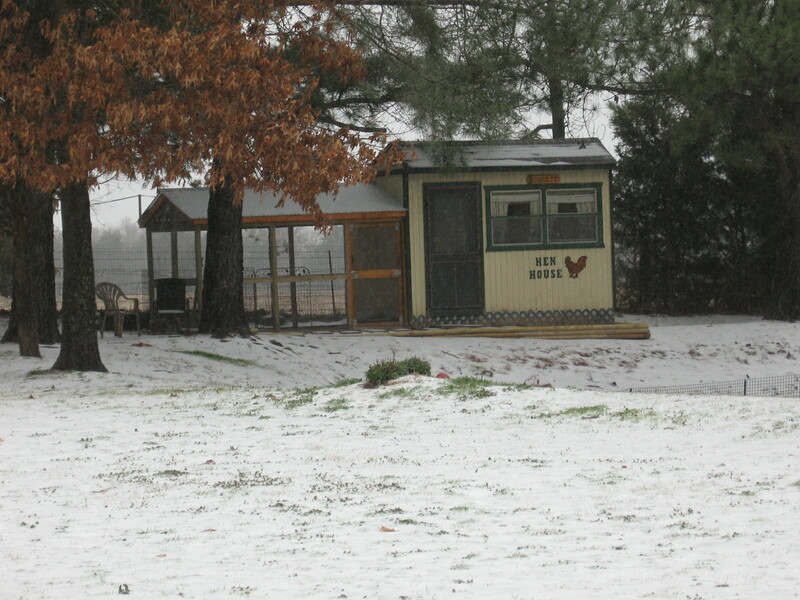 New eggs arrived from Oregon and Georgia last week so we need the covered room outside for all my “stuff”. This will give us a bit more room for the brooder chicks when they hatch. I made a trip to the “big box” lumber center to pick up a load of material for the carport project. You will notice that I mentioned earlier the weather was nice, in the mid sixties near seventy degrees. I managed to lay the block foundation for the wall on the north side and frame the wall with high hopes of completing the job by early next week. The temperature has plummeted all the way down to 28 degrees, expecting to hit 24 by Tuesday morning. The wind chill hovers near 18 degrees. We have almost a half inch of sleet that has practically covered the back yard and now it is snowing a bit. I have on two layers of clothing with a third on standby for when I venture outside. The furnace is working overtime, (not to mention the electric meter). And did I mention that it is very difficult to type this article wearing insulated gloves? Each day, we let the kennel dogs out for their morning constitutional. Have you ever seen dogs tiptoe? Most took one look outside their pens and made a beeline back inside. I can’t know for sure what they were thinking but I’m guessing the question they were asking me is, “What were you thinking? I’m NOT leaving the comfortable warmth of my inside pen!” Yeah, well, guess what dogs, I’m not rushing out for your afternoon pleasure either. This kind of weather keeps them inside on days like today. Their heaters keep them at a constant 60 degrees. Aah, such is a dog’s life. I noticed this morning a coyote in the pasture across the road and he was high tailing it towards the woods. He apparently does not like this weather either. However, there are some animals who enjoy a cold snap. Such as the Silkie chickens. At least the four adults do. They thrive on the rush of adrenaline. However, there are some young birds we call “juvies” (short for juveniles) who are not as well versed as the adults. They have a heat lamp and readily stay near the warmth. These are the residents of the “Chicken Condo”. On the hill, over looking the pond, we have a “High Rise” where eleven adolescents, four “juvies”, one blind hen, one broody hen and one smashing rooster reside. There temperature is also at 60 degrees. The only problem I see, is the hens are not laying eggs.Must be too cold. Yet, all the animals are in their comfort zone, including the geese. I, on the other hand, am dismayed at this weather. But I am not too worried. 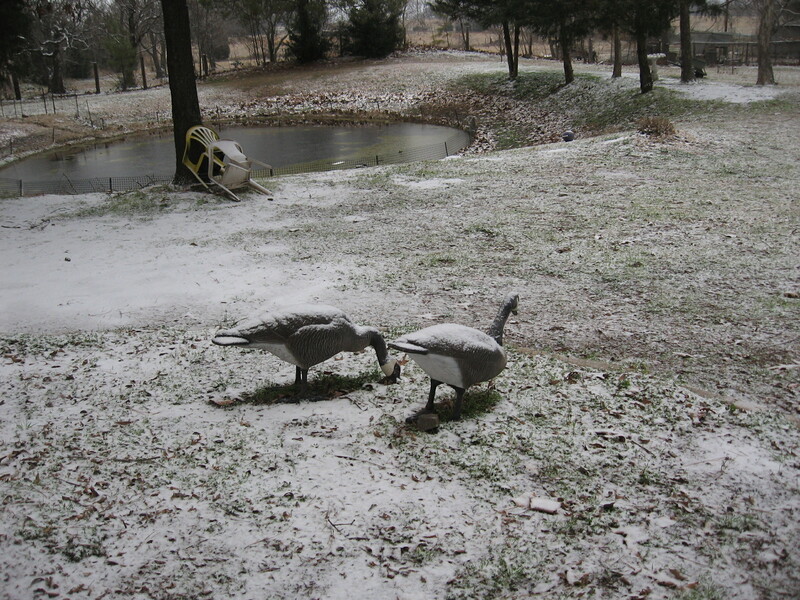 By Thursday, the temperature will be back in the low to middle sixties, maybe even seventy, I will be back, hammer in hand, working on my carport, the dogs will be barking to be let out, the chickens will be laying eggs again and winter in North Texas will be back to what we call normal. Hmmmmm, Are those snow clouds I see on the horizon?